Todays bag comes with extra added gummi bears. Oh and a pretty rad Doraemon sticker too. 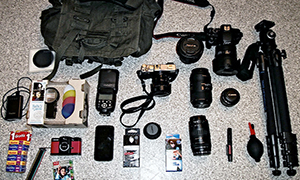 Come and see what Nick is keeping in his bag. My name is Nick, and it’s a bit difficult to say where I’m from… I grew up in Jakarta, but Sydney is more like my home now, and I’m currently on travel in Singapore for several months for internship (unfortunately not related to photography). My bag from time to time is changing, most of them stayed with me for a year before I change to another one, but I think I have found the one now. 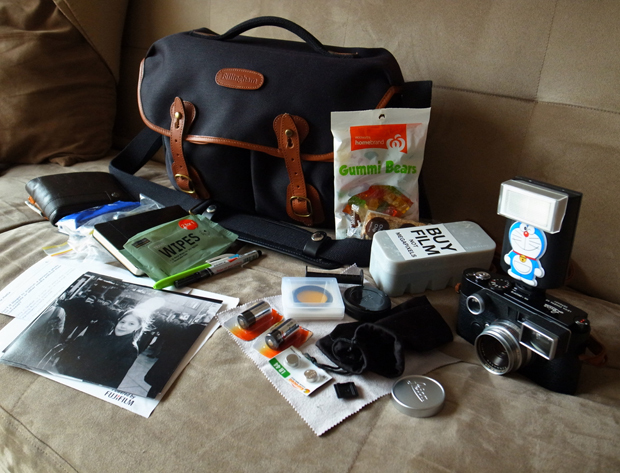 I’m now using Billingham Hadley Pro bag. 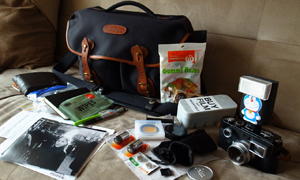 If you are new to photography, trust me, choosing a bag that’s suitable for your taste and need can be more difficult than choosing a camera or lens. I think it could be as difficult as choosing the right partner! 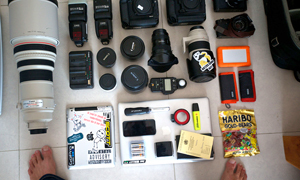 My M6 TTL, in a glance looks like an MP, this is because I have the special Millennium edition. I got it for a very good deal. It has the same film advance lever and film rewind lever as the MP, and it’s black painted brass just like the MP. The only difference is that my M6 TTL is a little taller than MP, shutter dial turns the opposite direction and it has TTL flash. I love my 35mm Summaron – this copy was made in 1962. It’s a very sharp lens, it’s CLA’d so working smoothly like new. There’s so much to say about this lens’ mechanics – to my taste it’s a lot more solid and buttery smooth compared to today’s Leica lenses. I don’t see many of these being used among street photographers in Sydney or probably anywhere. Even if I upgrade to the 35mm Summicron ASPH one day, I think I’ll still keep this Summaron with me… I want to get an M3 someday, and since 35mm is my focal length, this is one of the few lenses I can use on it without more external viewfinder. 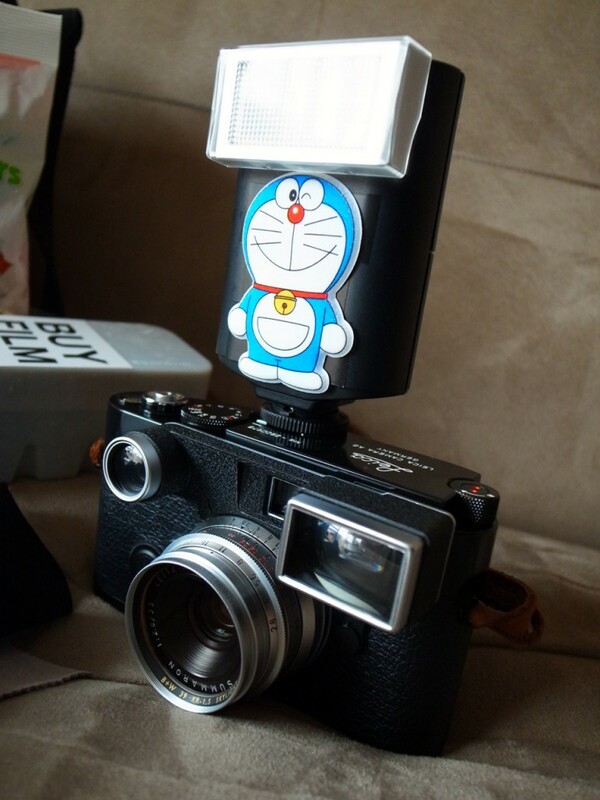 …with a Doraemon sticker on it :D I think of this as a social experiment, and believe it or not, I’ve had people smiling at me on the streets just because of my funny-looking camera. This is inspired by Charlie Kirk who uses Hello Kitty stickers on his camera. I was looking for Hello Kitty stickers but it’s so damn hard to find an original Hello Kitty stickers these days (there are lots of fake cats stickers everywhere). Seriously the best pocket digital I have used to date. It’s a street camera, a landscape camera, travelling camera, social-gathering camera, and its macro mode is nothing short of amazing. 4) Some of my prints. Some people/friends I met are intrigued by my cyclopse-looking camera, asking me how does the picture looked like. This is the best way to show them, instead of telling them to visit my site or Facebook. 5) Confectionaries and muesli bar. Of course, Haribo is the best brand and the world standard for gummy bears, but it’s not that easy to find here in Sydney, so I often have the local home-brand in my bag. I’m not too picky about food in general, so it’s not a biggie. While I’m at this, I think Haribo originated from Germany, just like the Leica. Perhaps this is why it became the world standard. 6) A bag of Panadol, band-aids, eye-drops, travel wipes, lens wipes and stuff. 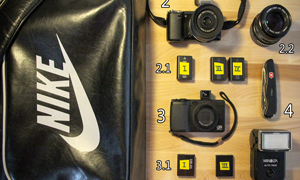 7) A bag of spare CR123 batteries, spare LR44 batteries, 39mm B+W yellow filter, 39mm B+W 81A filter, lens cap that I never use, a 120 film spool that I keep as my lucky charm. I usually have Neopan 400 or Portra 400 in this, depending on the project I’m working on. Of course, I would pack Velvia 50 instead if I’m having a particularly colourful mood and day or dedicated landscape photo trip. I got the hard cases from Bellamy. 9) Water bottle (650ml). I sometimes carry sandwich too. To make myself feel like a MacGyver. But really, it’s sometimes useful. I engraved my name on it when I was travelling to Switzerland. I blog on http://mountain-light.tumblr.com and my photos can be seen on http://nsusatyo.smugmug.com. I sometimes Tweet too @sunnicron. Thanks for sharing your bag with us nick. 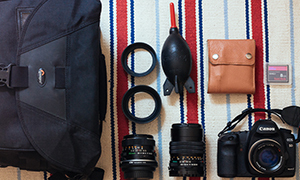 It is great to see a film case in the bag. And I love the Doraemon sticker, it is very different. Check out Nick’s links and make sure you come and comment, we love it when you do. The first letters of the founders name and the location of the factory make the name. Thanks Bob… I was trying an M3 in local used Leica dealer recently, it’s a mighty wonderful pair. Now only if I could get one of those beauties! Wow, this is great news when I come back to Sydney next year! nice camera & lens, I have the same kit. Congrats! That’s a great idea to carry some prints in your bag. I had never thought about it. I’ll try to do the same.